Ryan's own admission of earlier bumps related to very slow delivery times as documented by dissatisfied customers posting on forums; and the same for a review loaner we'd signed up for which never materialized. As he stated too, much water had passed under that bridge. Show comments and formal reviews had indeed been highly laudatory. 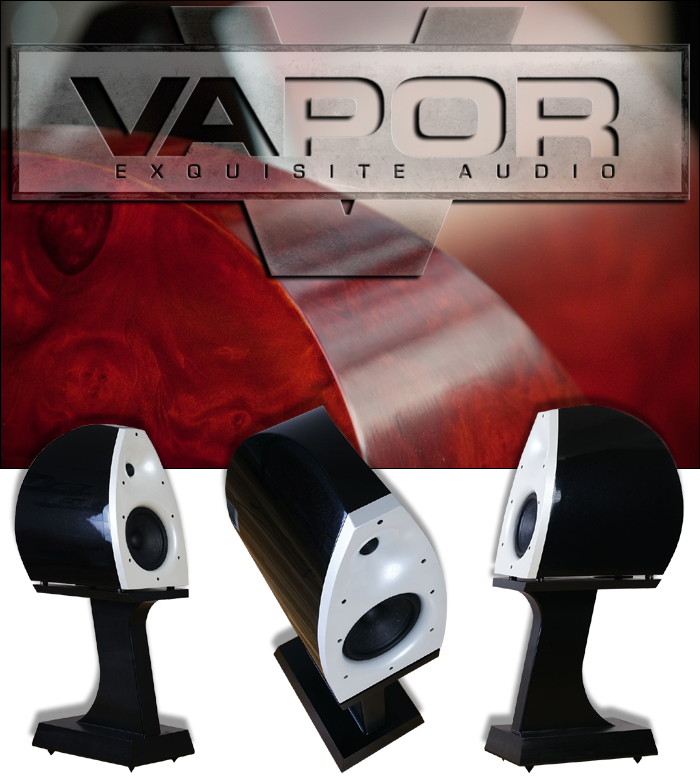 To that any impartial observer would have to add Vapor Sound's made-to-order model of direct sales with extensive à-la-carte options and documented willingness to consider off-the-carte requests as well. This operational scheme combines custom-shop appeal on finish and xovers parts with high value. The latter comes from cutting out the usual middle men. Your money buys better parts and more labour for more advanced builds. Running Vapor Sound as a quasi custom shop implies no typical mass-production inventories. It's only after consulting with Ryan and settling on a specific model and trim that's best suited to your budget and needs that actual work on it can begin. Which, likely very unrealistically so, assumes zero back-log on orders which were placed before yours. Readers thus must remember that my review couldn't possible cover more than the usual commentary on sound, appearance and relative value. You must conduct your own due diligence on wait times and exactly what happens should you find yourself dissatisfied with anything about your delivery given that it was built especially for you. That's the logical price to pay for working with not only a direct seller but one who essentially builds to order. One can't hear such products at dealers. Either a friend owns a pair or you hear one at a show. That's mostly it. It's precisely why folks like Ryan need reviews. In the absence of dealer demos, reviews help to legitimize a product and place it within competitive context. After Ryan's email, I took a closer look at his current model range. I wrote back that "the Aurora is the model I'd like to take a look at. Its design brief, appearance, specs and price all hit the right marks in my (white) book." Ryan replied that "the Aurora would be perfect. I have been thinking recently that I would like to have it reviewed. We have a pair in metallic Black that could be shipped immediately but it sounds like you would prefer white. Good news is that in approximately 6 weeks we will also have an all white pair we could send. They are coming back to us as a customer trade-in. After a refurbish we could send them on their way." 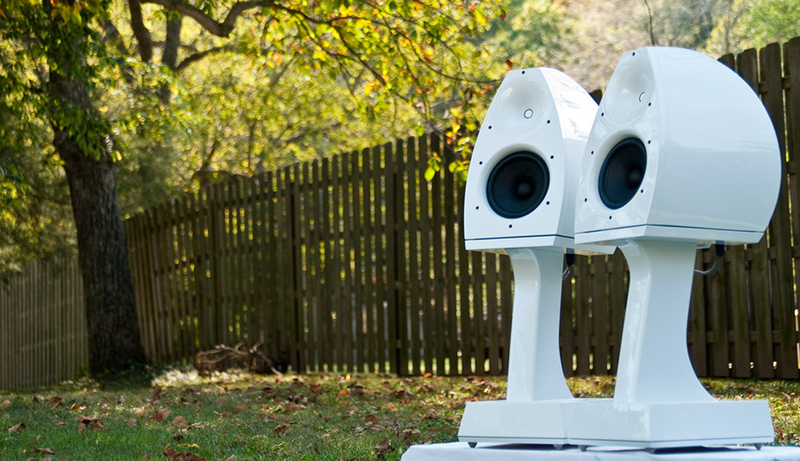 A fully run-in pair in all white would definitely tickle our décor and my ears from the word go. And six weeks wasn't such a long way off. The moons seemed to be aligning on their own accord. The double baffle's outer layer removes with eight bolts to create access to the driver mount flanges. "Would you prefer a set with standard parts; or would you rather have some upgrades included?" I told Ryan that this decision would be up to him. Then I gave him a listing of my favorite kit with brief descriptors of why I liked it. "In short, I like a very lucid fast time-accurate sound that kicks in at very low volumes to not require SPL to be involving. I hate thick, pudgy, hooded, veiled, laid-back, warm, fuzzy and cozy. If I want to fall asleep, I'd rather go to bed than sit in front of my hifi. Key triggers are microdynamics and tone. Soundstaging is fun but not vital. What's vital is timing and proper tone density." If Ryan could translate those verbal pointers into specific parts upgrades he thought would play to them, he was welcome to massage the review pair accordingly. I'd not know the difference, only the final outcome. Either way the shipment would include a full build sheet detailing the components included. Knowing just how difficult it was to do any remote sound readings for people one has never met and whose systems one hasn't heard, I was very curious how Ryan would react and what upgrade parts, if any, he'd recommend from his option menu. But first, why was the Aurora my pick of his litter and not another model? Because of five specific things. 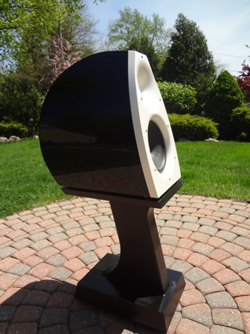 • 1: with a port tuning of 39Hz and a -3dB point of a fierce 31 cycles, it perfectly conformed to my notion of mating a broad bandwidth monitor to a subwoofer for only the very first octave, i.e. 40Hz and below. And at 89dB sensitivity, such extension wasn't paid for with punishing inefficiency. Bravo! • 2: if you're into ultimate midband lucidity, a 4" driver might be as big as you want. Yet for maximal tone and weightiness in the same band, an 8-incher should be just about perfect. I'd personally draw the line at anything bigger. To me Zu's 10.3" widebander or a vintage 12" Tannoy dual-concentric sacrifice too much upper midrange insight. A good 8er also goes considerably lower than a 4er or even a 6.5er. The flip side is that it demands a special tweeter to meet it low enough. Here Ryan's preferred Raal ribbon was out. His 7" tweeter waveguide for the Aurora creates just enough acoustic gain to shift the 2nd-order hi/lo-pass xover hinge to 1'100Hz.